2016 has been a hugely significant year for Royal Museums Greenwich. The Cutty Sark was given as a permanent gift to the National Maritime Museum, The Queen’s House re-opened in time for its 400th anniversary and the Armada Portrait was secured for the nation after a successful fundraising campaign. 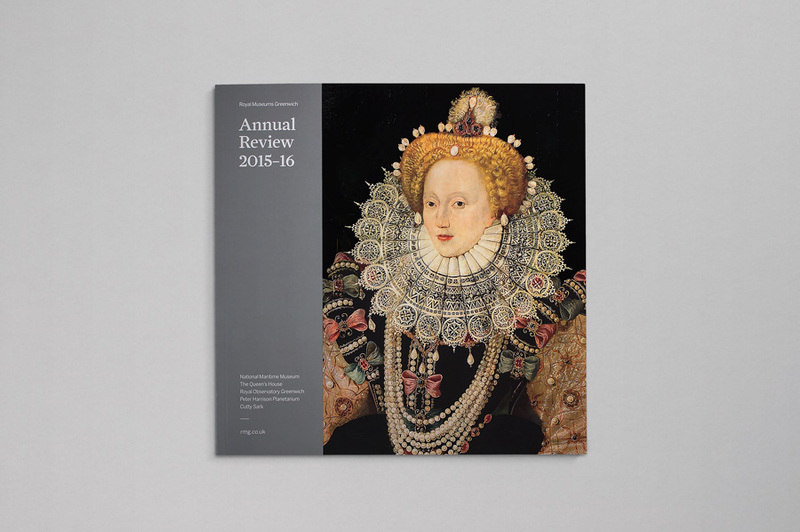 The annual review we designed features the iconic portrait of Queen Elizabeth on the cover and brings together all the news, developments and exhibition reviews from the five word-class sites in one contemporary design. Whilst much of the year’s news focused on Queens, the annual review caught the eye of HRH The Duke of Edinburgh, who sent a personal letter to say how much he’d enjoyed it – despite the captions being too small to read! The annual review is our latest piece in a busy year of work for Royal Museums Greenwich, which has included the promotion for a major exhibition at the National Maritime Museum, an international Travel Trade campaign and a summer visitor campaign encompassing all sites.